Curiosity was my entire reason for reading Twilight, but that curiosity came from several different sources. One was how the series as a whole has been publicized as the next Harry Potter. Since I love Harry Potter, reading this book thus made sense. And also a lot of my female friends had told me that this vampire love story was really amazing. Meyer has achieved quite a feat by making the scenario completely human and believable. She begins with a familiar premise, that of a new kid in school, and gets us thinking that this will be yet another realistic young adult novel. Isabella Swan's move to Forks, a small, perpetually rainy town in Washington, could have been the most boring move she ever made, even if she soon becomes the centre of attraction for most of the boys in school. But once she meets the mysterious and attractive Edward Cullen, Bella's life takes a thrilling and terrifying new turn. Bella learns from family friend Jacob Black that legends say that the Cullen family are immortal vampires. Until now, Edward has managed to keep his vampire identity a secret in the small community he lives in. Edward’s family are all rescued vampires headed by Dr. Carlisle, who has taught them how to peacefully coexist with humans. For Edward's sake they welcome Bella into the family but difficulties arise when James, a tracker vampire who is intrigued by the Cullens' relationship with a human, wants to hunt Bella for sport. After reading Twilight, it was clear that Harry Potter and Twilight are poles apart. Twilight is a spellbinding gothic love story of a mere mortal and her vampire boyfriend. It is an easy and enjoyable read and is sure to make the readers eager to read the next three novels. It is a story that grabs people in its hold to follow how the relationship between a human girl and a vampire boy could be possible. The relationship is fraught with dangers, so full of the wonderful feeling that heralds one’s first love, yet so impossible, that it does not let you go. Twilight fans cannot get enough of the charismatic Edward Cullen and the pleasant and adorable Jacob Black .Teens and adults alike will love this touching fantasy novel and will surely be engrossed from the first page. You have to take it for what it is, a unique and entertaining story. Meyer leaves her readers wondering if Bella and Edward’s relationship will stand the test of time. 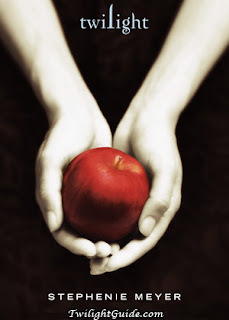 Will Bella move on into adulthood while Edward remains ageless at seventeen for all eternity? You will have to pick up a copy of Meyer’s second book in the series, New Moon, to find out. I had ignored Twilight until I reached the point where I succumbed to the constant, omnipresent lunacy that had been bombarding me for quite a while now. I gave in only because I wished to see what fascinated the readers to such an extent that they were driven to fervent obsession. I’ve always ridiculed the movie but now I finally saw where that mindless script comes from. The basic outline of the story is fairly simple – Edward the vampire romancing a teenage girl named Bella. Add to these characters certain traits, like an Adon-isian blood sucking vampire, a constantly whining, trying- hard- to be-emo teenager and the terrifying villain who is waiting to drain Bella’s body of blood and voila! You have countless girls practically worshipping the book. The book unfortunately for me did not live up to all its hype. One could instantly spot what was missing and the most obvious flaw was that Twilight was written in sheer haste. The concept of the book is not at fault. It is the author’s lack of building up on the concept that reduces the story to what it is. The vampire and human love saga has quite successfully been articulated in the past. Twilight however was just another run of the mill story. What Stephanie Meyers missed out on was innovation. Had she written the same book with a little more creativity, it would have been acclaimed much more. For instance, books like Harry Potter and Lord of the Rings have the same ordinary concept of the existence of a magical world. What makes them different are the efforts put into making the books so novel. J.K Rowling took care to create every spell, every incantation which held its derivation from Latin words and attention was given to the smallest details. Stephanie Meyers failed to do so. And on the few occasions that Meyers does try to make an effort, it makes you wish she had never tried in the first place. For instance, In Twilight, the vampires refrain from stepping out in the sun because doing that would make them sparkle like a DeBeers solitaire. Another defect was the storyline. She follows one measly plot that held no twists. There weren’t any multi-layered or parallel plots that would have made her work at the very least passably interesting. It follows one straight path that is extremely predictable. Twilight was a mundane repetition of certain things. If the adjectives used to describe Edward’s looks and Bella’s constant complaints about gym class were reduced, the book would be a leaflet. The characters themselves were not properly etched out. Why Bella was always whining is a mystery yet unsolved. Whatever the situation is, she seems to be unhappy. Meyers makes a transparent effort of giving her character a flaw and the best she comes up with was turning Bella into a klutz which does not do any justice to her character. Edward also seemed to be as confused as though he was suffering from a terrible concussion. The only saving grace was the verbal communication that Bella and Edward carried out. However, the expressions described during such moments were such that if imagined within the mind’s eye, a rather grotesque image would be formed. These substantial bits also dragged on considerably and ended up making the reader yawn. The book largely appeals to those who are in troubled relationships or wish for being in one in which their dream man swoops down to carry them off to another world that is filled with corny, high school love. That is the picture painted by the author. And as if the book was not clichéd enough already, once Edward is done saving Bella from the bad boy (in this case “vampire”), he whisks her off to the prom! I would understand why this cheesy love story, minus a substantial story line or worthwhile characterization, would appeal to the early teenagers. However as to why adults swoon over the book is beyond my realm of rationalization. Uhm..the appeal to the older female audience is the Romeo and Juliet syndrome. All the angst to make a 40 year old feel like a 15 year old again and yet written a little less predicable than your standard weekly romance novel. I can deal the simplistic nature of the Meyer's writing style because it was written for the younger reader. However, I agree with your assessment of the leaflet. All of the books in the Twilight Saga have about three inches of angst and one inch of plot, which is hastily thrown into the latter half of the book.